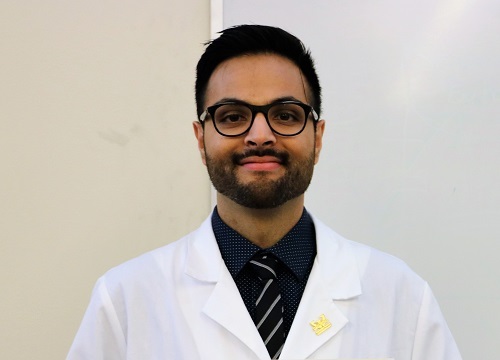 A first-year medical student at the Wayne State University School of Medicine was part of a California-based research team that discovered the addition of antibiotic powder decreased postoperative infections when applied before closure following spine surgery. "Ours was the first study to evaluate the use of tobramycin powder in spine surgery," said Arif Musa, M.S., a member of the M.D. Class of 2022. "What we found was that use of antibiotic powder significantly reduced the rate of infection, from 5.7 percent to 2 percent. Adding tobramycin reduced the infection rate further to 1.8 percent, but the difference was not statistically significant when compared to vancomycin alone." The risk of infection is great enough that spine surgeons routinely use preventive antibiotics to reduce the likelihood of infection, given intravenously, Musa said. A subset of patients in the study were given vancomycin powder, placed directly in the surgical site before closure. Another subset were given both tobramycin and vancomycin powder. "Our findings were in favor of applying antibiotic powder to supplement intravenous antibiotics due to a significant reduction in number of infections. However, there does not seem to be an added benefit with tobramycin," he said. Musa worked on the project in spring 2018 using a multi-center, electronic database search of patients who had posterior instrumented lumbar fusions. "Does Addition of Tobramycin Powder Reduce Infection Rates After Spine Surgery," was published in the December issue of the Global Spine Journal. "Surgical site infections are a devastating complication of spine surgery and surgeons are always on the lookout for reducing them, even if the incidence is particularly low," Musa said. "Surgical site infections often require readmission and debridement, which means the patient has to return for a second operation. Even if the infection is successfully treated, there is often a psychological effect that lingers with the patient afterward, with complicates recovery, reduces satisfaction and compromises quality of life."